Start a new Halloween tradition with this spooky tree perfect for hanging frightening photos and scary souvenirs. 1. Find a dead tree branch, clean it of dead foliage and spray paint it with glossy black paint. Allow the paint to dry. 2. Fill the urn with water to determine the volume of liquid needed to fill it ¾ full, then empty it. 3. Mix the appropriate amount of Plaster of Paris needed with water according to package directions. Be sure to blend until the mixture is smooth with hardly any lumps. It will be the consistency of cake batter. 4. Fill the urn with the Plaster of Paris mixture and immediately place the tree branch in the center of the urn. Use low-tack painters’ tape to secure the tree in place and leave it to dry. The plaster will have a firm set within 30 minutes to 1 hour, but it will take 24 hours to completely dry. 5. 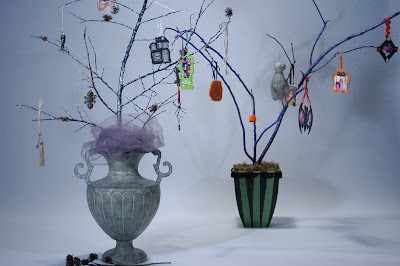 Add eerie detail to the tree by outlining the branches with black and silver glitter glue and twisting faux spider webs across a few branches. Hot glue some dried flowers that have been painted with glitter. Insert battery-powered twinkle lights and hide the plaster with silver or grey tulle. 1. An old cake topper with the face and hands painted ghoulish green and hung by a string “noose”. 2. Bits of black or silver lace wrapped around a miniature Popsicle stick and decorated with rhinestones and painted feathers. 3. Scrapbooking typewriter letters spelling out “B-O-O” on a black paint-washed filigree jewelry finding. 4. A banshee made from a doll head and a cheesecloth ghost body, sprayed grey and black. 5. A scrapbook escutcheon washed with black and silver craft paint. Add some sparkle tulle and glitter paint to backboard. 6. A haunted house silhouette: Cut two house shapes from black scrapbook paper. Cut out windows and a door with craft knife. Cut one house shape from silver paper and sandwich between black pieces. Highlight windows and doors with a silver marker.